Virtuozzo® SSD Enhanced Managed Private Cloud Servers (Cloud VPS) from ViUX® with Built-In Server Automation Software from Odin® – lets you to easily manage and stay on top of your server, anywhere you go. Starting off with your first Blog, Website or e-Store? You can begin small with a basic Cloud VPS that has all your needs covered! Xtend your Cloud VPS power with increased starting resources to support your growing Websites, Web Apps and Email needs. Virtuozzo® Cloud Server & Ultra-Fast SSD Cloud Storage - Performance, Reliability, Dynamic Scalability & Failover. Optional Parallels® Plesk Panel - Complete control at your fingertips... Web Applications, Websites, Email, etc... with ease! Business Quality Email with optional Microsoft Exchange ActivSync, plus Cyren® Premium Antispam & Antivirus. Help is never more than a click or call away - Chat Live anytime or Email / Submit a Ticket for EXPERT Hosting Support. Private Cloud Servers or Cloud VPS (Virtual Private Servers) are different from Shared Cloud Servers or Conventional Dedicated Servers, which leaves many users wondering for what exactly is a Private Server. ViUX® leverages our state-of-the-Internet Cloud Hosting System, based upon Parallels® Cloud Server and Dell C6220 (Cloud-Series) Servers, to provide Private Cloud Servers as “Containers” or “Hypervisors” running Linux or Windows Server Operating Systems. We have answered most of the frequently asked question in this section. If you feel that your desired question has not been answered then feel free to contact us. What is Private Cloud? What is Cloud Storage? Does Cloud Storage improve performance? What are the benefits of Private Cloud (Cloud VPS) over Virtual Dedicated Servers? Why deploy business critical systems on such a limited and failure prone environment as a regular Dedicated Server, when a better alternative (Cloud VPS) exists? What is Managed Cloud? What are Containers? What are Hypervisors? How can I check my server’s performance? ViUX Systems has been recongnized as the Partner of the Year for 2013-14 (Americas Region) by Virtuozzo. Shared Hosting on Cloud Servers via Virtuozzo® & Cloud Storage… ViUX deploys Shared Cloud Hosting on multiple Cloud Servers using Virtuozzo running on ultra-fast SSD enhanced Cloud Storage. WEB, DATABASE & EMAIL services are distributed across separate Cloud Servers using Plesk Onyx for reliable Shared Hosting with dynamic scalability, replication & built-in failover for trouble-free / high-performance Shared Hosting in the Cloud. WordPress; Drupal; Joomla; DotNetNuke – these and many other popular Web Applications can be installed into your Website(s) easily via the 1-Click Applications install function of Plesk Onyx. 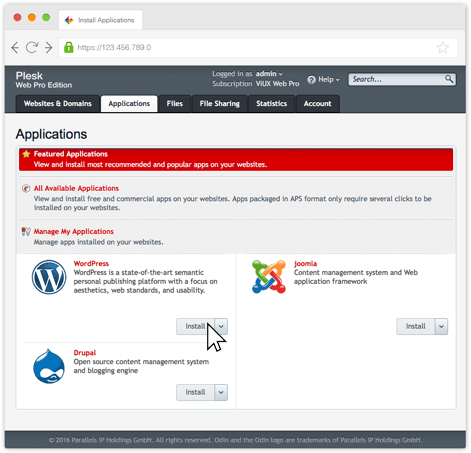 Further, ViUX can make the entire Application Packaging Standard (APS Catalog) of Web Applications available for install as 1-Click Applications from within Plesk! Cloud Hosting service without SUPPORT is NOT much of a service… ViUX Cloud Hosting features 24 / 7 / 365 Support via Live Chat; Email / Tickets; & Toll-Free Phone. All tickets feature a 1-Hour Response SLA from our staff of EXPERT Hosting Techs. MAILBOXES is the default number of “Email Accounts” provided for all Websites Hosted within the subscription. Xpress = 10 to 100 Mailboxes & Xtreme = 30 to 300 Mailboxes. Additional Mailboxes / Email Accounts are $0.25 each. Linux Email is via Postfix with RoundCube & MagicSpam. Linux-Hybrid & Windows Email is via SmarterMail Enterprise with Cyren® Premium Antispam / Zero-Hour Antivirus & optional MS-Exchange ActiveSync. DOMAINS is the default number of Domains / Websites that can be created for Hosting within the subscription. Xpress = 1 to 10 Domains with additional Domains being $0.50 each. Xtreme = UNLIMITED Domains. Each Domain created has independent webspace, resource allocation, and management. [Traffic] is the amount of monthly Data Transfer (Bandwidth) provided for all Websites Hosted within the subscription. Every Website visitor and every Email sent or received uses some amount of Traffic. ViUX provides “UNLIMITED” Traffic for our Private Cloud Hosting, which means that we do not impose a hard limit on the total amount of Traffic used by Websites or Email; however, there is a practical limit to the total amount of simultaneous data that can be handled by a Cloud Server’s Virtual-NIC Card as generated by (X) number of Websites Hosted on that server. Therefore if it is known that a certain Website will have high-traffic needs, we recommend a Bare-Metal Dedicated Server.